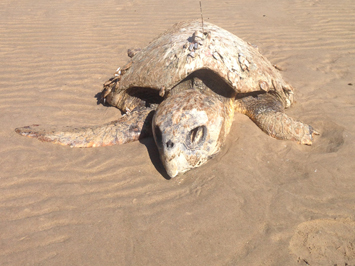 Northern Territory Government scientists are helping their Western Australian counterparts researching endangered sea turtles as part of a vital satellite tracking project. WA Department of Parks and Wildlife principal scientist, Dr Scott Whiting, said this is the first time turtles at these sites had been tracked. “Understanding more about important habitat areas will allow potential threats to be identified and managed,” Department of Land Resource Management marine scientist Rachel Groom said. “We contacted the Department of Land Resource Management who, together with Parks and Wildlife Commission NT officers, organised a search and rescue mission to find Marloo and ultimately recover her body so that a necropsy could be performed in Darwin,” Aub Strydom (Researcher for Gnaraloo Station) said. Ms Groom said pathologists from the Department of Primary Industry and Fisheries will perform a necropsy at the Berrimah Veterinary Laboratory tomorrow with the results helping to identify cause of death and add to a growing knowledge base of megafauna nationally. “Our counterparts in WA called us on the Marine WildWatch number 1800 453 941 to alert us to Marloo’s situation and we thank the Tiwi Land Council for promptly providing access permits,” Ms Groom said. “We urge anyone who sees or comes into contact with sick or injured marine life to call the Marine WildWatch number so we can investigate and provide assistance if possible. “Turtles are a great indicator of sea health so the more we learn about them the more we learn about the waters they inhabit.